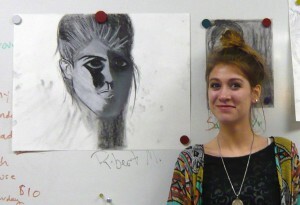 The student model loved it that other students said her portrait looked like David Bowie, which raises a question. Is it more important that a portrait looks like the portrayed or someone the portrayed likes to look like? -- I hereby name this phenomenon the Art 108 Ziggy Stardust effect. I'm improving bit by bit each class. Every time I think I mess up I actually improve my art. So I learn valuable art lessons by messing up. I can ALWAYS fix things. So it was a good day. Today I learned how to draw a hand and a face with basic shapes, like blocks. I found it easier to draw using the shapes rather than using the point of a pencil. I learned a new medium, the India ink. The range of value you could get from it is great and highly interests me. Today I experimentes with using paint brushes to blend charcoal. I never realized that was a technique. I have learned that I need more practice drawing real humans. I'm getting there. I'm slowly moving away from the cartoony style. I did nice chiaroscuro on my portraits. I did some boxing in the darks before I put in detail. It made it much easier. I think I showed good use of positive and negative space on my last drawing.